State of Disunion: How do we cross our bipartisan divides? When Americans seek reassurance about the health of their democracy, they often read the affirmations of Alexis de Tocqueville’s classic Democracy in America. It is time also to read this same book’s valuable analysis of some flaws in American democracy that vex us as much today as they did during de Tocqueville’s visit in the 1830s. Three in particular provoke deep contemplation: corruption among public officials, high levels of bombast in public discourse and, above all else, the threat that a rising plutocracy could seize control of the state. The third flaw is often a cause of the first two and so merits special attention. Since the Citizens United v. Federal Election Commission ruling by the Supreme Court in 2010 declared that corporations have the same rights of free speech as individuals, an enormous amount of money has flowed into political discourse. Although sometimes unbidden by the candidates themselves, the resulting distorted advertisements show an unabashed intention to manipulate the electorate into choosing officials who will nurse the hands that have fed them financially. The process today is as close as it has ever been to fulfilling de Tocqueville’s warning of a possible plutocratic takeover. The ruling in Citizens United has legal antecedents. Since the case of Santa Clara County v. Southern Pacific Railroad in 1886, the Supreme Court has sympathized with the view that the right to property expressed in the 14th Amendment extends to corporations. It is a small extension of that tradition to conclude that corporations have a right to freedom of speech as well. The Santa Clara case, however, helped ignite the Progressive movement at the turn of the 20th century, during which substantial efforts were undertaken to make government at all levels more responsive to the people. There is reason for hope today because historically each surge by the plutocracy provoked a reaction on behalf of the wider citizenry. The political genius Jefferson applied in his Inaugural Address, however, was to pretend that he could take for granted the acquiescence of the entire electorate in his presidency. “During the contest of opinion through which we have passed, the animation of discussion and of exertions has sometimes worn an aspect which might impose on strangers unused to think freely and to speak and write what they think,” he said, making believe that what had really been the animosity of the campaign had been the vigor of free speech. By so pretending, Jefferson brought about acquiescence in the result. He also set a blueprint for the limits of partisanship that has been followed ever since. He said, “This being now decided by the voice of the nation, announced according to the rules of the Constitution, all will, of course, arrange themselves under the rule of law, and unite in common efforts for the common good.” He then introduced what he called “this sacred principle”: that while the political majority must prevail, its will must be discharged reasonably. The political minority retained its rights, and their violation would be oppression. It is good for us today to ask whether Citizens United leaves the political minority resulting from any contest with its rights intact. Jefferson’s warning that the hyperpartisanship of the young republic might come to resemble the religious warfare of Reformation Europe clearly indicates that the hyperpartisanship of the early 21st century would both concern him and be familiar to him. His Inaugural Address is worth a fresh look because the man who expressed this anxiety was our first truly partisan president. Jefferson abandoned the aversion to party shown by his two predecessors. In fact, the coalition formed by Jefferson and James Madison in the early 1790s to oppose the policies of the Washington administration was the first real American political party (the Democratic-Republican Party). As chief executive, Jefferson would pursue his belief that a president is most effective when he governs from the head of a political party. In his Inaugural Address, however, Jefferson shows that he knew when to turn off his partisanship. We need more like him if today’s United States is to be politically healthy again. Partisanship has deep American roots, and it has always been controversial. George Washington deplored factionalism in his Farewell Address. By contrast, James Madison in “Federalist No. 10” saw the potential benefits to a large republic when many small factions must coalesce and trade off with one another if anyone is ever to reach a political majority. Madison was more prophetic about how the republic would actually work than Washington was. And while the longing for Washington’s nonpartisan ideal lingers, we come closest to it when we follow the counsel of the Jefferson inaugural. Beyond the threat of plutocracy, there are other problems. First, politics has become too much a full-time occupation, and professional public officeholders have become too dependent on professional political handlers. We have lost much of our sense of citizen participation in public life. 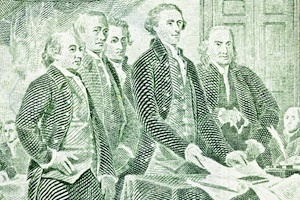 Founders like John Adams, Benjamin Franklin and Jefferson had varied interests and multiple careers. By contrast, Dwight D. Eisenhower, our last president who did not spend the majority of his career in politics, stated that he was wary about Lyndon B. Johnson as a prospective successor because L.B.J. had no hobbies or interests outside politics. This kind of narrowness remains a worry. Second, political handlers, in particular, seem to measure their success by whether they can manage to destroy the reputation of their clients’ opponents. Candidates generally go along with this. Even winners of elections often emerge from the process with their moral standing seriously damaged. This makes it much harder to persuade good people to seek public office and limits their effectiveness if they are elected. Third, fewer media outlets these days strive for well-rounded reporting. Instead, they often champion particular points of view only. Cable channels, blogs and Internet sites are often unabashed in their preferences. The problem with this change is not so much what these outlets say as what their watchers and listeners do with the information. It has become too easy for people to separate themselves from perspectives they might disagree with. One thinks of the voter in a heavily one-sided neighborhood who expressed surprise when a member of the other party was elected to office by a landslide. It could not be, she said, because none of her neighbors had voted for that candidate. Fourth, political professionals often act as if they can obtain the electoral results they seek only if they scare voters. I frequently receive e-mails that push some candidate or issue. Almost always they predict the apocalypse if someone is not elected, some bill fails or a court ruling goes a certain way. Gone is the perspective of John Quincy Adams, who said of his defeat for re-election to the presidency: “The sun of my political life sets in deepest gloom, but that of my country shines unclouded.” Ironically, his sense that the country could survive without him probably accounted for the quick revival of Adams’s political career and his election to Congress just two years after losing the White House. Another saying that deserves recollection is by Hubert Humphrey, who commented that anyone can get through a concession speech gracefully by considering it as the first speech of his next campaign rather than the last of the unsuccessful one. American politicians have also lost their sense of self-deprecating humor. The wit and irony of a Robert Dole for the Republicans or a John F. Kennedy for the Democrats are not much emulated today. A bit of Irish-American political doggerel might be particularly useful for the professionals to revive now—the adage “Don’t get mad, just get even.” It has been said that this proverb prevented Boston politicians of the immigrant era from descending into total hatred. Perhaps the greatest passage in Jefferson’s Inaugural Address was his identification of the underlying values that the two main parties of his era shared: “Every difference of opinion is not a difference of principle. We have called by different names brethren of the same political principle. We are all Republicans, we are all Federalists.” What he meant by this was that his contemporaries presumably agreed that we should have both federal government (the Federalist preference) and state government (the Republican preference) in this country. The only quarrel was how to balance power between these two areas of the system. Jefferson thus marked parameters of the debate that calmed it considerably. Of course, storms continued to break out. A couple of years ago I visited the tomb of Senator Charles Sumner of Massachusetts and was surprised to find that a wag had placed a cane upon it. This was a reminder that in 1856 Sumner survived a caning on the Senate floor from a member of the other house after an extremely partisan speech. Earlier, in 1798, Congressmen Matthew Lyons of Vermont and Roger Griswold of Connecticut fought each other with tongs and a cane on the House floor. When I walk down the street in Seattle, however, I see people treating each other respectfully for the most part. Outside the professional political class, there is much civility and mutual toleration. We need to look to ordinary citizens to spot the national consensus, our common principles. I am confident that today we can identify a unity of principles, just as Jefferson did. One last point: The comparison in Jefferson’s admonition that we not allow our political arguments to become like the religious wars of early modern Europe was not coincidental. If there is proof that U.S. citizens are capable of tolerating difference, it lies in the way we have learned to practice religious toleration. Even before independence, the settlers recognized that the way to survive together in the wilderness was to stop persecuting each other over religious difference. Jefferson led us to do the same in politics. At the laying of the cornerstone of the National Cathedral in Washington in 1907, Theodore Roosevelt suggested that the only proper competition among religious denominations should be a friendly contest to see which of them could perform the most acts of charity among the American people. Other observers of the religious scene in the United States have also mentioned the desirability that these denominations think in terms of service to others ahead of any sense of empowerment over others. Why not propose similar thinking for our political parties? In this spirit, we need to celebrate examples of partisans who reached out to one another. History records several famous examples of pairs of presidents who began as friends, became estranged over politics and then reconciled. The first pair was John Adams and Jefferson, partners in the war of independence but so estranged on the day of Jefferson’s inauguration that Adams left the capital without greeting his successor. But eventually Adams initiated a correspondence with Jefferson that became the glory of their old age. A more recent example is that of Harry S. Truman and Dwight D. Eisenhower, partners during World War II and the subsequent reconstruction of Europe, but then torn apart by the bitter political campaign of 1952. Over a decade later, when the assassination of President Kennedy presented to the nation a lethal expression of political extremism, Eisenhower invited Truman to share a limousine to the funeral. By the end of that day, they shared a drink and agreed that their differences had been exaggerated. Over the long-term, Americans have tolerated difference well. It is up to us to bring the same tolerance and goodwill back into politics. De Tocqueville included civic spirit on his list of America’s democratic virtues; we can hope that this trait will trump the danger of plutocracy. One way to overcome the partisan divide is for a largely corrupt national media to apply a definition of partisanship equally to both parties. The partisanship charge is almost always leveled by media-types against Republicans. Look at the Supreme Court. If the conservatives vote together, the Court is partisan etc. When the liberals vote together, almost always, no one says a thing or bats an eye in the national media. The liberals were all in lock step for Obamacare but there was narry a comment about partisanship. Funny how the first comment illustrates the very problem the author has identified. Personally, I cannot imagine any set of circumstances under which it will be possible to bridge the partisan divide in this country in my lifetime - and I am currently 47. Rather than assigning blame to any political party, I'd suggest that the primary reason is that the overwhelming majority of Americans - even the very best educated among them - are not properly educated in what it means to exercise the awesome responsibility of being a citizen in a democratic society. Most of us are told that our primary responsibilities as citizens is to secure a well-paying job that will enable us to purchase as many consumer goods as possible, thus promoting our nation's economic well-being, and that our educational system should be geared primarily to the achievement of those ends. It is any wonder, therefore, that partisans of all stripes are incapable of understanding the substance of their own arguments, let alone understanding or even acknowledging facts that threaten their self-reinforced positions? As a society, we largely dismiss the values a liberal education provides - such as the ability to think clearly, argue persuasively, understand history, and acknowledge that human beings (and hence solutions to human problems) are incredibly complex. If a catastrophe as great as the terrorist attacks of 9/11 could not engender a spirit of bipartisanship capable of lasting longer than it took to have a day of prayer and reflection to mark the event, I challenge anyone to tell me what calamitous event or set of circumstances will. Government suppressing free speech rights of any group especially during an election campaign as the FEC (Federal Election Commission) did to the Citizens United group that happened to be incorporated is a proven bad idea that does nothing to resolve or prevent the nation's political conflicts or divisions. The Citizens United Supreme Court decision ruled once again that the U.S. Constitution Free Speech rights apply to everyone, without exception, including groups of people that are organized as corporations rather than private associations or groups that not incorporated. Corporations are a modern form of organization that people organize under. People do not lose their Free Speech rights because they are organized as a corporation. The Citizens United Decision ruled that the McCain Feingold law which the FEC used to suppressed the free speech of the Citizens United corporation was unconstitutional because it violates free speech rights. Ridiculously Citizens United a political advocacy group was being told by the FEC that it could not express its political message(s) or it would be fined. The FEC was censoring political expression. The Supreme Courts as it has done for over 230 years has upheld Citizens United and all corporations and unions free speech rights, free of government censorship. As the Constitution says "Congress shall make no law .. abridging the freedom of speech ... " No law means no law. There are no exceptions . Free Speech applies to everyone even to some people whom this article d regards as "plutocrats" and therefore undeserving or unworthy of having free speech rights that may be expressed as political expression during a political campaign. Excluding people from expressing their political views because they happen to be organized as a corporation as Citizens United was is arbitrary and capricious and cannot be justified under the U.S. Constitution. Have you not heard of libel? slander? the “limitless lawless action” test that replaced "clear and present danger"? Frank #1, by "corrupt national media" do you mean the so-called "main-stream media"? As opposed to, say, the "fair and balanced" approach of Fox? Did you actually read this piece? Does such a serious dismissal of a vast portion of the professional press fit within De Tocqueville's concept of a civic virtue? "The liberals were in lock step?" Do you know who appointed Roberts? Is your narrative more important than reality? Tom (#4) asserts that "People do not lose their Free Speech rights because they are organized as a corporation." But does that mean that a corporation becomes a person? I can organize a corporation with some people but I don't become one. We are talking about Free Speech Rights which by itself should put everyone on the highest alert as if someone set uff bringht flares at night. "If the First Amendment has any force , it prohibits Congress from fining or jailing citizens, or associations of citizens, for simply engaging in political speech." The McCain Fiengold law used by the FEC (Federal Election Commission) actually supresses speech by threat of heavy fines and imprisonment of up to five years. Why? Becasue Citizens United would express a poltical view. Since when is the federal government ever involved in the business of censorship of politcal speech by fines and imprisonment? Suppressing Free Speech is never allowed but especially the suppressing poltical free speech. As the Court repeated in Citizens United " Political speech is 'in depensable to decisionmaking in a democracy, and this is no less true becasuse the speech comes from a corporation rather than an individual,"
Never mind the identity of the speaker is, goevernemnt suppressing Free Speech is just not Constitutional. As for whether a single SCotUS opinion is the cause of much of any thing, ask and answer the question "has anything really changed since that moment?" My take on the right of free speech is: lying on your resume' is valid, even if you are exposed as such. In the California Supreme Court such a lie to gain office was free speech, i.e. : he claimed to be recipient of a military honor was permited because he did not actually wear it publically and falsely. Oh yeah, freedom of speech, I forgot that this is why no one is held liable for all but the most egregious outrageous speech. Is this really the way to maintain our democracy? Any speech is OK as long as I agree with what is said. Swallow it whole, endorse it and fling it across the internet without any attempt to check the facts. But do not hold the media responsible. They are not required to present an even handed analysis (free speech!). So how are we to come by the facts, by reading all thse proposals ourselves and doing our own analysis? Perhaps so since our lawmakers and media seem to lack the energy to do so. This article also appeared in print, under the headline "State of Disunion," in the July 16, 2012 issue. Thomas R. Murphy, S.J., is associate professor of history at Seattle University in Washington State.